A chainsaw is an expensive piece of equipment to ease your woodcutting and tree-felling needs. However, with each successive use of this hefty machine, it shows signs of wear and tear. Even with adequate maintenance, there will come a time when you would need to buy a replacement. With that in mind, here’s a guide to help you get the best chainsaw chain to suit your sawing needs. First of all, why do you even need to get yourself a brand new chainsaw chain? Well, this part is essential to your cutting needs. Let’s recall that a chainsaw works by guiding a cutting chain around a metal bar. Thanks to the teeth of the chain, small cuts rapidly begin to bring down wood regardless of its thickness. The main purpose of a chainsaw is significantly reliant on this part. You cannot just keep using the same chain if it becomes dull. Likewise, the teeth of the chainsaw chain cannot cut in too deep. While it’s great for a chain to cut wood quickly and deeply, a too deep cut could result in a kickback and injure the chainsaw operator. This unexpectedly violent movement can cause serious injuries or even fatal consequences to the skilled chainsaw. Thus, you need to use only the right chainsaw chain. Now that you know why getting the adequate chainsaw chain is important, let’s look into the essential characteristics. No matter what the brand or the size of the chain is, these factors will help you pick a safe and optimal chain for your sawing operations. You can never completely remove the vibrations while cutting, but they can definitely be reduced. After all, too much vibration can affect not only how precise the cuts will be but also how long you can use the chainsaw without the extreme tiredness. There are chainsaw chains with built-in features can prevent excessive vibrations. Aside from vibrations, another issue you would have to deal with is a chainsaw kickback - the chain gets stuck too deeply into a section of log or branch. Once this occurs, the chainsaw bar and the chain can go in reverse or an upward manner and hit the operator violently. This can easily lead to injuries or, worse, death. Some chainsaw chains have low-kickback or reduced-kickback, chain brakes and so on as prevention. This is why there are variants that cut slower than normal for beginners and casual chainsaw users. You do not just get a chainsaw chain because of the brand name and the price. Regardless of its quality, it won’t work if you get the wrong size. An incorrect chain size won’t fit into your chainsaw properly. It can either be too tight or too loose. Some replacement chains can not be returned for another size, so make sure that you get the right size before making a purchase. First, read the instruction manual just in case, or simply measure the original chain if you do not have the guide. Secondly, in line with this, you have to learn what the chain pitch is. This is accomplished by calculating the distance between three rivets located on the chain. These rivets are responsible for binding the links together, and they can be viewed from the side portion of the chainsaw chain. Locate the center of one rivet head. Calculate its distance up to the head of the third rivet. Divided the resulting distance in half. The quotient will be the chain pitch. Once this is combined with the number of drive lugs, you will get the chain length. Thirdly, find out what a chain gauge is. It is the needed chain length to get a chainsaw chain perfectly fits the bar. On the other hand, the chain gauge is responsible for maintaining the chain movement. It keeps the chain sliding with ease around the bar without any issues during operations. What exactly is the chain gauge? This is the measurement of the drive lugs, which are found at the edge of the bar. These drive lugs ensure that the chainsaw chain won’t be separated from the bar during operations. Thus, these keep you safe from potential injuries resulting from the chain being removed while the machine is running. To get the right chain gauge measurement, you would need a dial caliper. With appropriate knowledge on both the chain pitch and the chain gauge, you will definitely find it easier to find the right chainsaw chain. This chainsaw chain offers a low kickback feature to reduce the potential of severe injuries. The amount of vibration is reduced to prevent user fatigue. Essentially, Husqvarna made the 531300439 H30-72 Pixel Saw Chain with the consideration to the lightweight in mind. Since it’s created for light saw variants, it will require less power compared to the average cutting systems. The chain of the H30-72 Pixel Saw Chain executes a narrow kerf and is specifically designed for chainsaws with the engine size ranging between 35 cubic centimeters and 55 cubic centimeters. The chain pitch measures 0.325 inches while the chain gauge is at .050 inches. Despite its low vibration and low kickback properties, Husqvarna assured that it is formidable enough for professional use. As a replacement chainsaw chain, this works pretty well. At nearly $20, this is good enough for the occasional use of cutting down some wood. 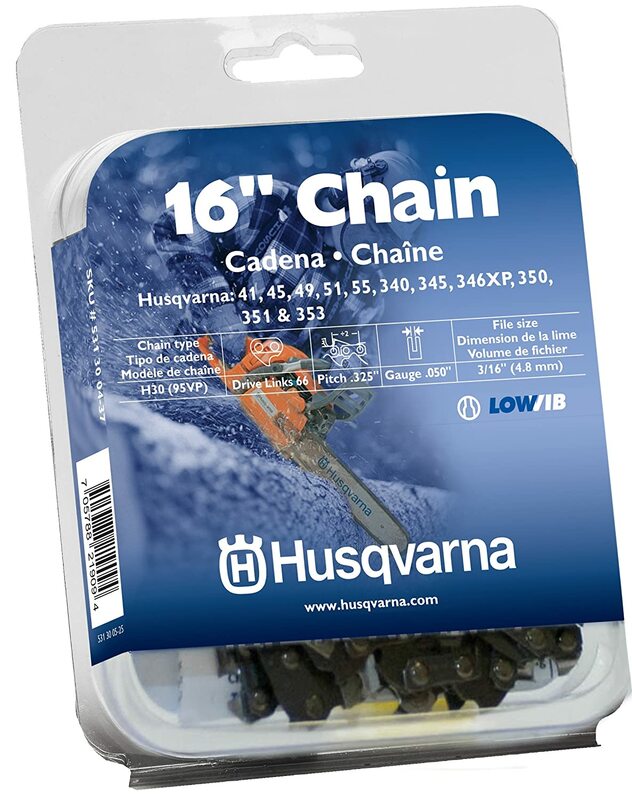 The Husqvarna 531300439 chain is not only durable but also retains its sharpness for quite some time. Even if it’s for a lightweight chainsaw, the chain manages to spew huge chips. The chain could last through a whole season with occasional use before need sharpening again. Easy to install around the chainsaw bar. Effectively cuts through dead trees. Significantly reduced amount of vibration during operations. Starting it for the first time could result in some hiccups. Not ideal for felling thick hardwood trees. Up next, we have the Oregon S62 chainsaw chain. The chain underwent heat treatment, hard chrome plating, and precision cutting to become durable and sharp. Moreover, the cutter has a distinct design for quicker and smoother cuts while also reducing the kickback. The chain pitch is 3/8 inches long while the chain gauge is at 0.050 inches. As for the drive links, there are a total of 62 that fit the 18-inch bar. Oregon employed various features that they noted as advanced technology. For one, the Chamfer Chisel cutters not only prevent kickback but also make chain maintenance simple. Consequently, the LubriTec feature ensures that both the Oregon chainsaw chain and the guide bar are lubricated enough to reduce friction and prevent overheating issues. The company also has the Vibe-Ban technology, which ideally cuts vibration levels by around 25 percent. 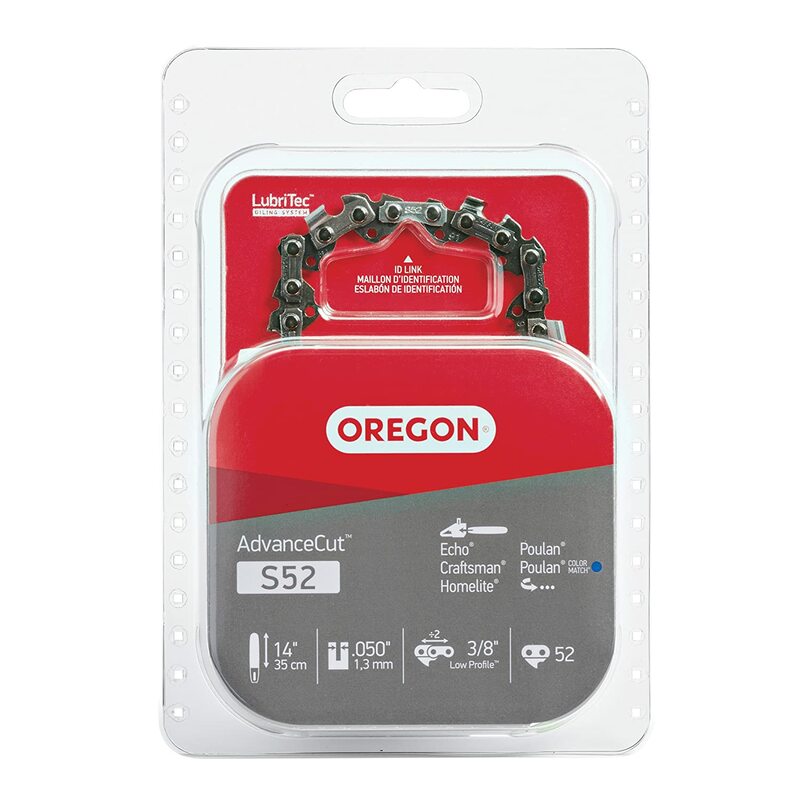 Lastly, the Oregon S62 chain complies not only with the kickback requirements of ANSI B175.1-2012 but also of CSA Standard Z62.3. The fit is good as it is neither too tight nor too loose to cause kickback problems. Releases sizable chunks of wood during cutting operations. Has more teeth than some of the original chainsaws chains we had. Cuts down most of the wood pretty quickly. Some of the chainsaw brands indicated on the packaging are not actually compatible with this chain so contact the customer service to make sure. Needs immediate sharpening as it can get dull upon felling several oak trees. Even exposure dirt can make the chain blunt. 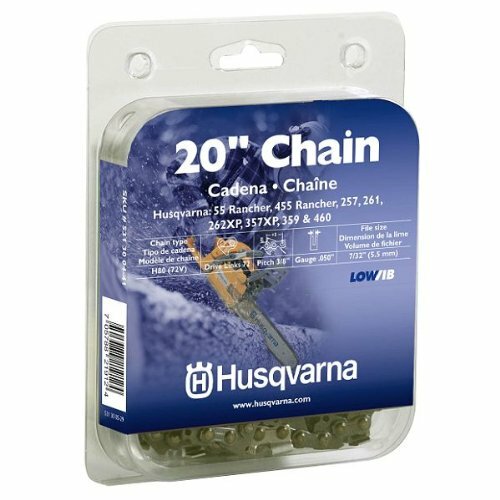 Here we have another Husqvarna chainsaw chain. While it also has the low kickback and low-vibration features of the first two products, this one measures just 16 inches. The company suggests using the H30-66 Pixel Saw Chain on saws with a 35cc to a 55cc engine, and it is power efficient. Its chain pitch is 0.325 inches long while the chain gauge is surprisingly at 0.050 inches. When using the Husqvarna 531300437 Pixel Saw Chain on walnut logs, they didn’t become dull at all. They were consistently sharp as they dealt with these logs measuring between 12 inches to 18 inches. The trick, however, was to sharpen the 16-inch Pixel Saw Chain before using it for the first time. For optimum cutting performance, we always had to keep it well-lubricated. This quick maintenance process ensures that the chain will keep throwing chips for longer time. Good chainsaw chain for cutting down tree limbs and small branches. Can last for several hours for light cutting purposes. Vibrations are not significant despite long cutting duration. Becomes dull fast if used on hardwood logs. Requires sharpening even before using it. The second Oregon chain we have is even 4 inches shorter than the previous product - only 14 inches. This short chain is designed to fulfill the cutting needs of both homeowners and casual users. Their safety is top priority, so Oregon made sure that it has a low-vibration characteristic. To reduce chain kickback without sacrificing precision, this variant has sturdy chamfer chisel cutters. These cutters are characterized by their twin corners, which work well with chainsaws that have a 3/8-inch chain pitch. Similar to the Oregon S62, the chainsaw chain of this 14-inch model underwent heat treatment and hard chrome plating to be as tough and sharp as possible. To keep the chain loops of this Oregon product linked, four-way symmetrical tie straps were included. During the first initial cutting attempts, this 14-inch chainsaw chain was impressive. However, we soon realized that it can become relatively dull even with careful handling. Easy installation and fits well with the appropriate chainsaw models. Good enough for quick and light cutting operations. Symmetrical tie straps link the chain loops. 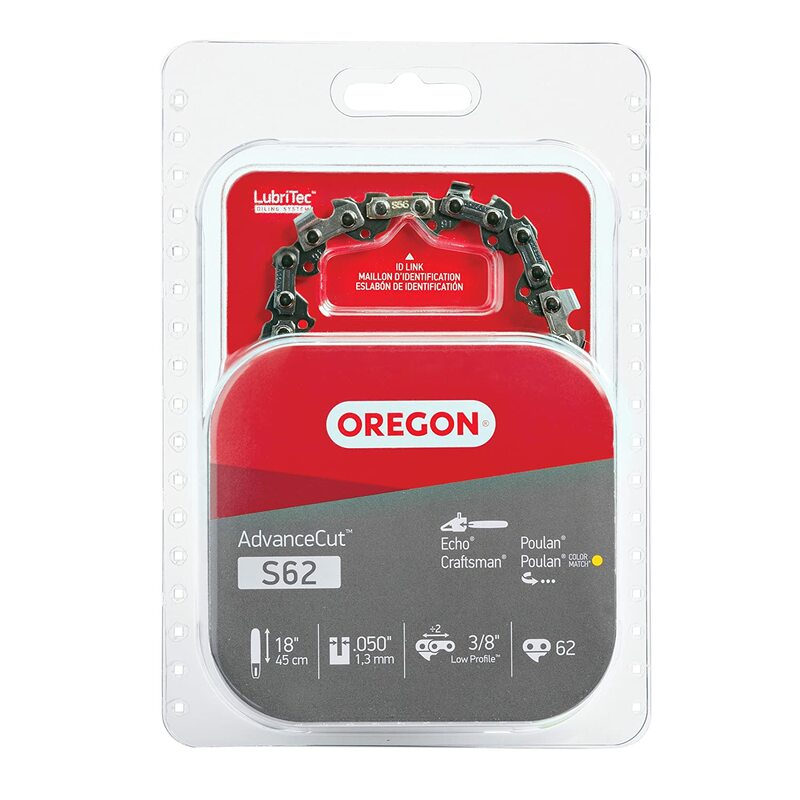 You have to contact the Oregon customer service to ensure that the chain works with the recommended chainsaw brands displayed on the packaging. Instruction manual could have been better written. 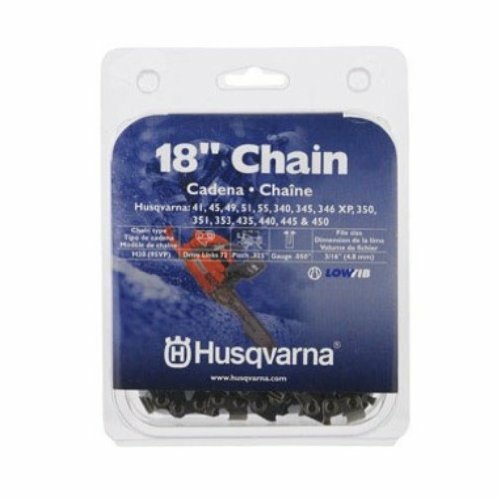 Finally, we have the third Husqvarna chainsaw chain, which happens to be the longest on this list due to its 20-inch size. Similar to the other entries, this has a 3/8-inch chain pitch and a .050-inch chain gauge. Moreover, this is an Original Equipment Manufacturer (OEM) standard chain, so there shouldn’t be much worry about its compatibility with a chainsaw as long as the size is correct. The Husqvarna 531300441 H80-72 Saw Chain can make sharp and clean cuts as long as it is lubricated with enough oil. In addition, keeping it away from dirt and avoiding pinching the chain or cutting huge branches will keep it in good condition. Thanks to its size, this can deal with sizable logs. Of course, this is still a safety chain that prioritizes safety over aggressive speed. In addition, you have to be extra cautious for a possible kickback with a chain of this size. The 20-inch size makes it hefty enough for professional use. Produces sharp and clean cuts even on hardwood trees. Standard low-vibration and low-kickback features. Being a safety chain leads to a relatively slow cutting performance. Prone to stretching and wearing with just a few cutting operations. Overall, our favorite pick is arguably the Husqvarna 531300439 18-Inch H30-72 Pixel Saw Chain. At 18 inches, the chain size fits between the short 14-inch variants and the lengthier 20-inch models. Homeowners and professional users alike benefit from 18-inch chains as they are light yet powerful enough for standard branch cutting and tree felling purposes. Furthermore, it is durable and sharp enough to throw big chips. Unlike the other entries, the Husqvarna H30-72 Pixel Saw Chain can last for a whole season without needing to be sharpened again as long as it is used with care. The chain is easy to install and safety thanks to the reduced vibration levels and a low-kickback feature. We hope that you learned a lot from our guide on picking a chainsaw chain. It is important to get the right replacement chain to ensure optimum cutting performance. Likewise, features that are related to user safety are crucial in picking the right variant. If you have any questions regarding our guide, feel free to give us a comment.